The system is comprised of an Xbox Kinect sensor, which senses the height of sand in the box below it, and a computer loaded with a powerful video card and open source software. This computer then transmits the data to a projector suspended above the box which projects contour lines and other effects on the fine, white sand. Contour lines change dynamically as the sand is moved in the box. A simple closed-to-open hand gesture in midair creates rain so that students can observe drainage patterns. A monitor on the counter behind the system displays the contour lines in either two dimensions or three dimensions, as well. Dr. Cohn, who is engaged in the New York State Master Teacher application process for STEM educators, was introduced to the technology by a fellow applicant last year. After learning about this new tool, he enlisted the help of Jim Keelty, a fellow science and technology teacher to help build one for South Orangetown students over the summer. Junior Kayla S. was impressed by how augmented reality enables students to connect with concepts more readily. “You see it right in front of you in 3D and then as a 2D image on the (monitor) screen, like you’d normally see it on a page,” she observed. Hands-on, tech-infused lessons also help students retain what they’ve learned. An AR Sandbox project? “Students won’t forget it,” Mr. Keelty said. The AR Sandbox is outfitted with wheels and Dr. Cohn looks forward to taking it on the road to share with elementary and middle school students in the months ahead. 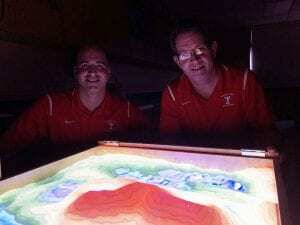 View a video of TZHS students experimenting with the AR Sandbox on YouTube.